Here – at last – we can compare two “big snows” on the Queen Anne Counterbalance, that unique stretch of hill climb that reaches from Lower Queen Anne to Upper. For a few decades these blocks were fitted with an underground trolley counterbalance. It featured a tunnel running beneath and in line with Queen Anne Avenue – but only here where it climbs the hill. Running on tracks within the tunnels was a peculiar “box car” made of concrete, which when hooked by cable to the bottom of the trolley helped pull it to the top of the hill – while the box car descended in the tunnel – and also helped brake it by climbing the hill when the trolley came back down it. And none were left on top. This unique device would not have been bothered by snow, unless it was a really big snow. 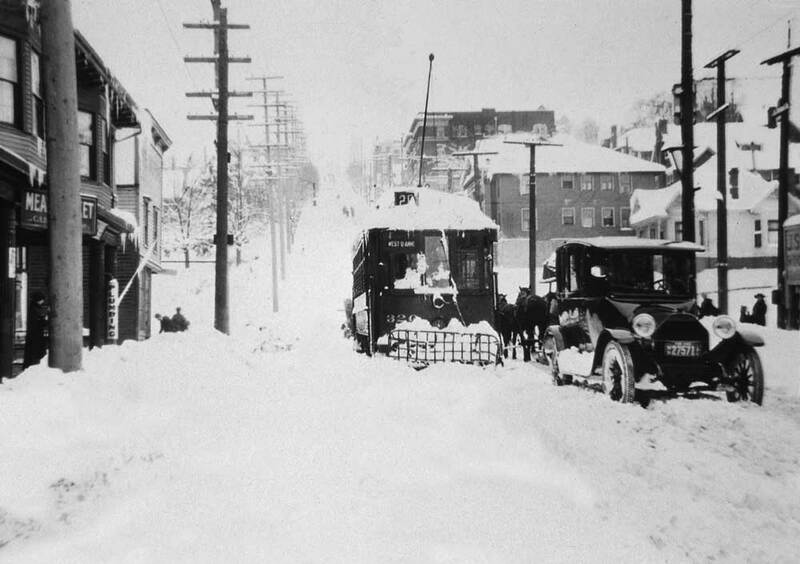 The 1916 Snow was such a pile that even the counterbalance cars here on Queen Anne Hill were stopped – like the one we see stalled in the middle of the Avenue between Mercer Street (behind the photographer) and Roy Street, behind the car. Perhaps the motorcar is also stuck – but not the horses. Jean is away to Chicago this weekend to see his son perform in a play. When he returns he will link this little blogaddendum directly to the blog’s history of Seattle snows. 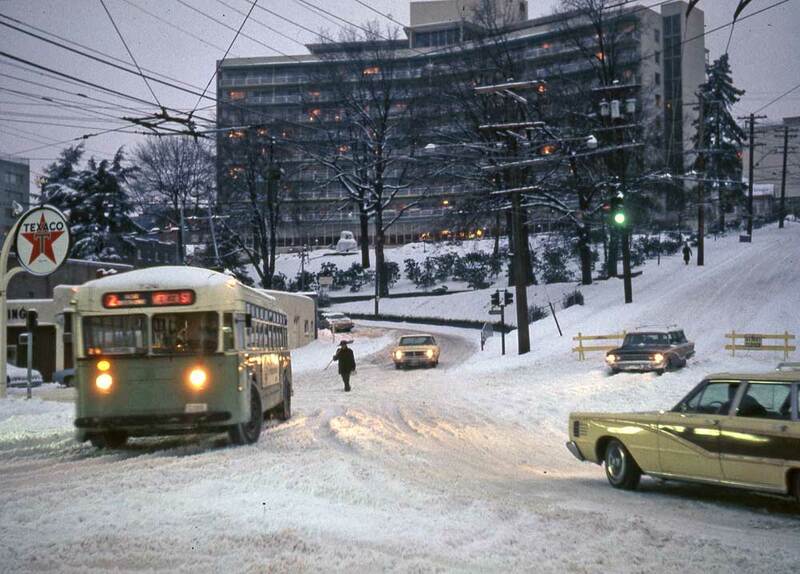 The snow of 1968-69 while not so deep as that of 1916 was still one of the most impressive of our “modern snows.” This view looks north from the southeast corner of Queen Anne Avenue and Roy Street. The Counterbalance Hill has been barricaded to traffic. I wanted to put this up in January 2009 when I worked on this blog’s Pictorial History of Seattle Snows, but I had to wait patiently for this slide to rise again to the surface of the light table, which is did earlier today. Queen Anne resident Lawton Gowey took this photo on the last day of 1968. The Bayview Retirement Community on the hill was then but one decade old. Hi Paul, towards the end of Dixie Lee Ray’s time as governor, we had a very clear and cold winter that saw Green Lake freeze. She decided that she would hire a bunch of old WWII planes and set up some sort of cloud seeding event towards the end of winter. Before she could get planes ready it rained again. Do you have any pictures of Green Lake frozen over in the mid to late 70s? With fresh snow in Seattle, closing the counterbalance, I came here to one of my favorite posts….mostly because I can see the house I used to live in peaking out from behind Bayview Manor!